Making porcelain requires patience, a lot of patience. It’s a SLOW process and you cannot be in a hurry. Little flaws made during the making process will always show up at the end, even if you don’t see them while you’re firing the piece/putting it in the oven. Porcelain is not forgiving. This can be frustrating, but you learn to deal with it. If you do take your time, the results are stunning. Porcelain is such a beautiful material. I just love its whiteness, its translucency, how thin it is and yet so strong. It’s always a special moment when you open the kiln after a glaze firing. You need to wait until the kiln has cooled down to 100° C degrees before opening it. Did all the pieces work well? Did they come out as you expected them to? Making porcelain is always exciting and each piece is so unique. 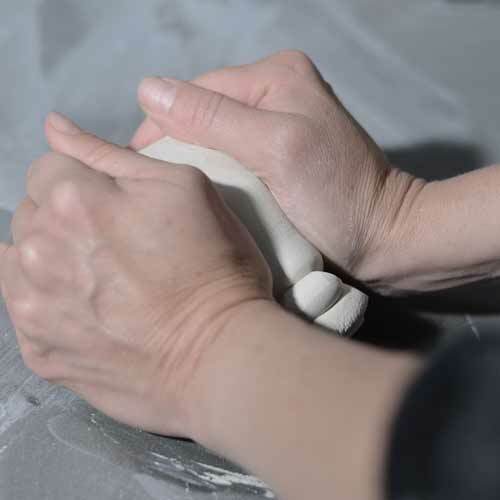 This entry was posted by Jacqueline Harberink in blog and tagged firing, handmade, kiln, making process, porcelain, potter's wheel, pottery, translucency.